Decorate the dining table for a wedding with our premium quality table runners. The affordable prices we have for the runners are a true bargain for all DIY brides. Don't forget that we have the flat rate shipping to further shrink your expending. A lace table runner is a unique way to decorate and protect your table without getting ever trying too hard for anything over-board. 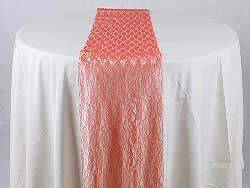 You can find a comprehensive array of lace table runners on BB Crafts, made from finest quality of fabric. BB Crafts has wide varieties of lace table runners in different colors and patterns, which are available at a cost-effective price. Not only this, save yourself from going out with the shipping service. Get the desirable table runner at your doorstep without experiencing any sort of trouble. Wholesale customers should login to your account to view your discount prices.